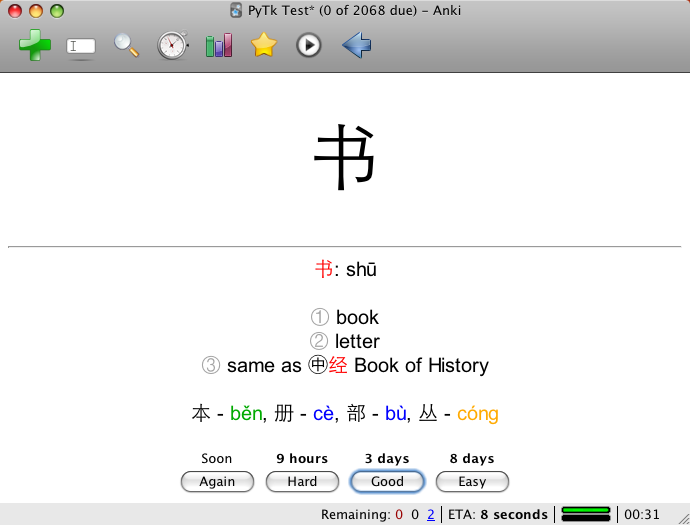 The Pinyin Toolkit is a plugin for the Anki spaced repetition system, which adds a ton of features useful to learners of Mandarin Chinese. Thanks to the hard work of the folks at the CEDICT projects, Pinyin Toolkit has great support for automatically looking up the definitions of words in both English and German, and limited support for French. 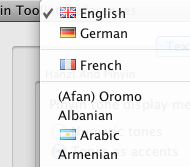 To supplement its built in dictionaries, the Toolkit is able to use Google Translate to supply missing definitions. By leveraging the same technology, the Toolkit is able to look up the definitions of Chinese words and phrases in any other language supported by Google - conveniently and automatically from within the familiar Anki interface. 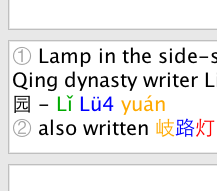 The Pinyin Toolkit automatically colorises Hanzi and pinyin in its automatically generated readings and meanings with a color corresponding to the tone that should be used in pronunciation. Because this turns tonal information into visual information, visual learners can use this feature to greatly improve their recall of tones. The colors chosen follow the standard set by MDBG for ease of interoperability, but you can customise them if you want. 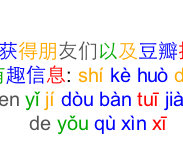 The Toolkit has great support for automatically generating basic Mandarin text-to-speech by stringing together samples from freely-available collections of Mandarin speech. Listening to the tone information in addition to reading it reinforces your understanding of the tones and eases the tricky task of remembering them. 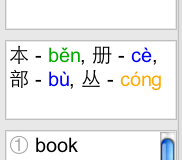 As well as inserting the appropriate measure words for a noun automatically into the meaning, the Pinyin Toolkit is able to break the measure word information out into a separate field. This makes it easier for you to give them special attention during revision, and helps you adhere to the minimum information principle when formulating your cards. The Pinyin Toolkit augments the range of standard Anki visualisations with a fantastic new one for learners of Chinese. 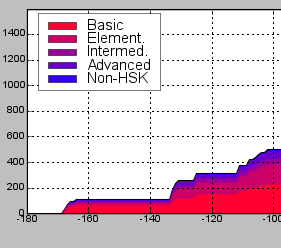 Using the Hanzi Graph, you are able to see graphically how far you have come towards each HSK level, and how your knowledge of the Chinese characters has improved over time. 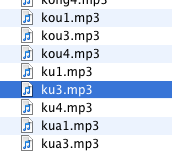 The project is open source and licensed under the GPLv3. Site design based on the Firebug website. The picture of Chinese calligraphy our banner is based on has been released under a Creative Commons license by the author, hto2008. Google is a registered trademark of Google Inc.